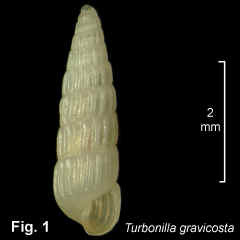 Description: Shell medium size, spire convex in outline, up to 9 teleoconch whorls. Protoconch coiled (Type B), of about 2 whorls, set on teleoconch with axis inclined at about 110° to teleoconch axis. Whorls slightly rounded, sculptured with about 16 strong axial folds, on last whorl terminating level with top of aperture; fine spirals between axials, continuing onto base as uninterrupted spirals. Aperture teardrop-shaped, columella without plaits. Shell translucent white becoming opaque with age. Size: Up to 4 mm in length. Distribution: Endemic to Australia: Iluka, NSW, southwards to Sydney, NSW. Habitat: Known from beach washup and subtidal to 27 m. Uncommon. Fig. 1: Little Coogee Bay, Sydney, NSW (C.342858).